This past weekend, September 15-16, Germantown Church of the Brethren in Philadelphia hosted the opening event of a year-long celebration of the 300th anniversary of the Brethren movement, which began in Germany in 1708. Events took place at the “mother church,” the first congregation of Brethren in the Americas, and featured worship, workshops, tours, exhibits, and music. About 150 people registered Saturday, and close to 220 attended worship on Sunday, filling the Germantown sanctuary to capacity. The congregation was founded on Christmas Day 1723 by German immigrants to the Americas, and its meetinghouse built in 1770 was the first Brethren meetinghouse in the US. Today the predominantly African-American congregation includes several members from African countries, with the pastor coming originally from Ghana. Festivities kicked off with a lunch served by the Germantown Women’s Fellowship under a tent on the church’s front lawn. Following lunch, participants chose from a variety of workshops on subjects such as the Sauer Bible, outreach ministries at Germantown, the history of the congregation, a Bible study on the anniversary theme, and several others. 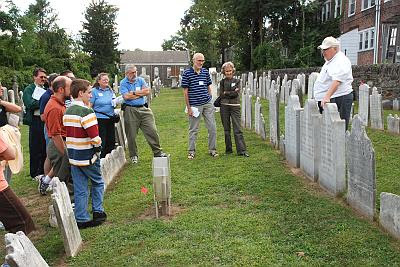 A Germantown Cemetery Tour was led by Kenn Cosgrove, a Grace Brethren member and treasurer of the Germantown Trust, featuring the gravestones of Alexander Mack Sr., the founder of the Brethren movement, and several other important Brethren figures. A Wissahickon Creek Tour took participants to the site of the first Brethren baptisms in the Americas in 1723. A worship concert by musicians and ministers at Germantown closed out the first afternoon of the celebration. That evening, Coventry Church of the Brethren hosted a hymn sing and pastor Sandy Christophel gave a presentation on the history of the congregation and its links to the Germantown church. Worship continued on Sunday with a morning service led by the Germantown congregation, and an afternoon service sponsored by the Church of the Brethren denomination, with a catered lunch between. As part of the 300th anniversary celebration, a Brethren Heritage tour is planned for next August to Schwarzenau, Germany, the birthplace of the Brethren movement. Ted Rondeau of Grace Brethren International Missions is organizing the trip.